Well it’s Friday in Velina (Campania) and we are a little gloomy! This is our last full day here. Tomorrow we will leave for the Rome airport and Sunday take a flight back to Philadelphia. OK, we are not really complaining. We have had 8 wonderful days here and the memories will last our lifetime. This is such a romantic country and our little area of Italy is very romantic. How can you not be romantic when you wake up to the sea and mountain views we have. The people are so friendly, especially towards Americans. The food and wine are so delicious. The beaches are cleanest in Europe. In a short week, we have become part of the Italian lifestyle. We eat slower, enjoy our food and wine more. We are more sociable towards others. We enjoy watching life go by. Everyone here seems to be so happy. This is why it is so hard to leave but we have family and friends that we miss dearly. Today we ate a big American breakfast at home. Slowly eating as we looked out at our views. When we leave we cover the furniture, table and bed in plastic. A years dust adds up! The plastic we used last year is dirty. Jo Anne has a great idea. We can look for a paint store or hardware store and buy plastic drop cloths. We know of such a store and go there. We are in luck and get 4 drop cloths for 1 Euro each ($1.30). Now it’s Isola Verde time for the Italian pass time of Coffee and free WiFi. After catching up on emails and Facebook, we discuss our day. 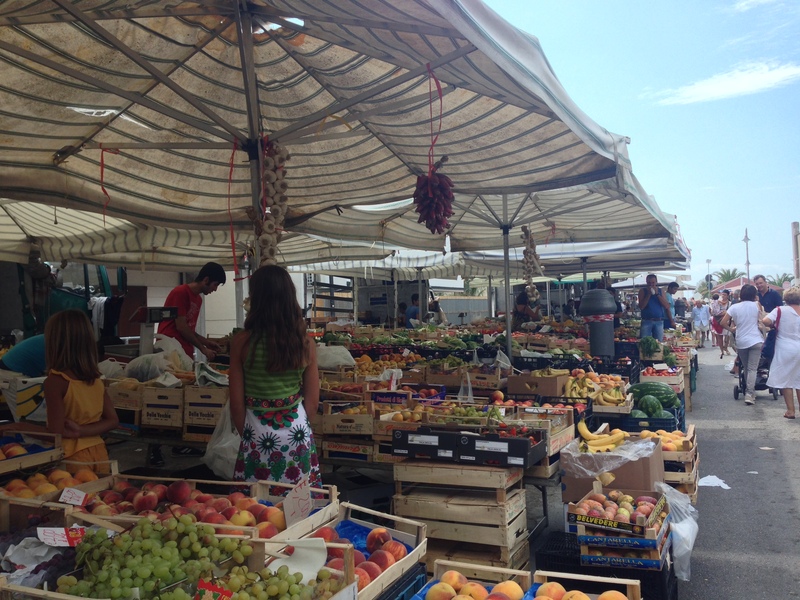 We saw on the way into Marina Casal Velino a Market on the street. They closed one of the side roads and put up stands to sell all kinds of things. We learn this happens every Friday all year-long. Jo Anne buys Due Scarpe (2 pair of shoes) and a tablecloth. We browse all the little stalls. There are clothing stalls, furniture stalls and food stalls. The food is all fresh from a local farm. This was the first really hot day we had. It is too hot to climb ruins. On the way home we saw a Bufala Mozzarella store and stopped in. They had everything made with Buffalo’s milk. Gelato, biscotti and of course cheese. We bought a huge ball of Bufala Mozzarella. That evening we had Mozzarella bruschetta. Tomorrow we will discuss Saturday and the drive to Rome’s airport (Fiumicino).